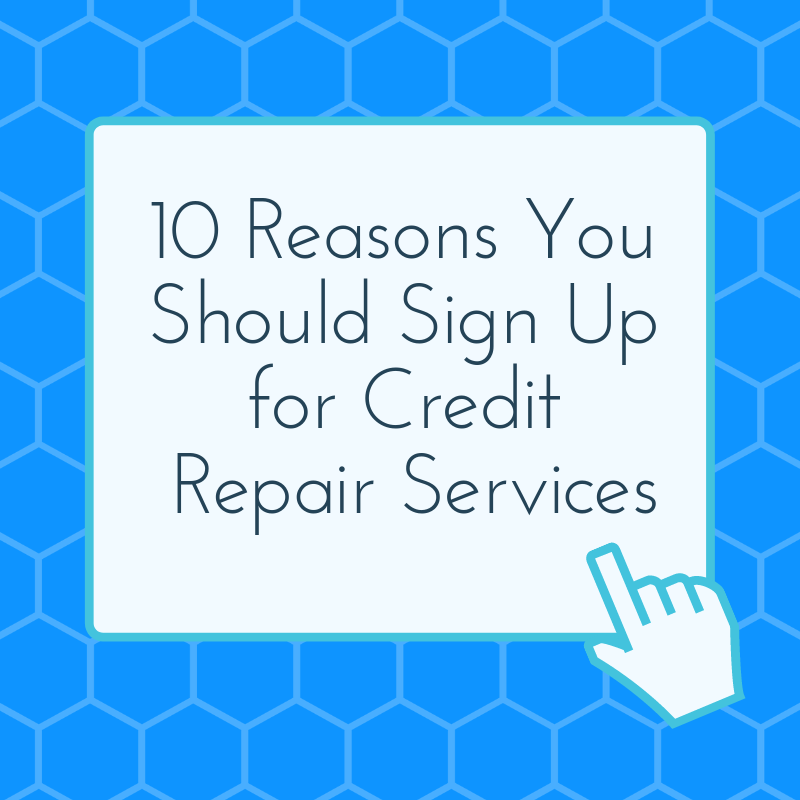 If you are in need of credit repair services, don't wait to sign up. Your credit report and credit score are what creditors reference when deciding to lend you money. Therefore, it is crucial that you not only know your credit score but that your report is accurate. By law, you have access to a free credit report each year from the three major credit reporting agencies (Equifax, Experian and TransUnion). By accessing your report regularly, you will catch errors that much quicker. If you are one of the many people who have issues with their credit report, what is holding you back from moving forward with a credit repair services company? Do you have doubts or questions on how a credit repair service can help you? We are just starting a new year and there is no better time to take control of your financial situation. Will you be shopping around for auto or home insurance in the new year? You’ll want to know that many insurance companies check your credit. If you have less-than-stellar credit, you may be quoted a high premium. Credit repair services can help you save on these necessary expenses. Are you jealous of friends who are using their credit cards strategically and racking up travel points and cash rewards? Moving forward with a credit repair service can help you repair your credit score, so that you too can finally qualify for these credit cards. Just imagine all the perks you’ll be able to claim with your new plastic! Just be careful, in order to use credit cards wisely, you need to pay them on time and in full each month. Let’s be honest: you don’t want to hear from debt collectors, and debt collectors don’t want to be contacting you. In 2019, get the debt collectors off your back once and for all. A credit repair service can potentially send cease and desist letters to these collection agencies on your behalf. Do you believe that renting your home is like flushing money down the toilet every month? If you find yourself dreaming about home ownership while you’re writing your rent checks, you should know that the dream of home ownership is within your reach - if you repair your credit. Make 2019 the year you get one step closer to your goal! You may be surprised to learn that some employers actually check the credit scores of job applicants before they hire them. Your ability to get your dream job may be affected by your credit. Level the playing field for yourself in the job market and repair your credit so you can increase your job opportunities in the new year. When your credit score is low, you will only be able to get high interest rates whenever you apply for a credit card or loan. When you repair your credit and get your score up, you will be able to qualify for more competitive rates which will save you money. When you sign up for service for your utilities and phone, your credit score will be checked. If you are viewed as a risk, many providers will make you put money towards a security deposit. When you repair your credit, you won't be hit with having to provide a security deposit. Tacking credit repair on your own will be an all consuming task to take on. The process is tedious and there is a tremendous amount of information you need to know in order to do it right. Hiring the right credit repair services takes all this stress away for you. The last thing you want to do is start the process and do something wrong or miss a step altogether, taking you back to square one. In addition to correcting errors on your credit report, credit repair services can also do something else very useful. When it comes to negative items on your report, the lender needs to be able to verify that the debt is indeed yours. If they cannot, by law, the negative item needs to be removed from your report. If you have something on your report that you think the collector does not have complete information on, the credit bureau should be asked to verify it. Debt is bought and sold all the time and often passed on with incomplete information. If they can't verify it, then you are off the hook for repayment. The collection account is taken off your report and your score won't be affected by it anymore. There is a whole market out there that caters to people with bad credit. There are cash advances, payday loans or short-term installment loans, to name a few. The issue with these, is that you will be paying very high interest. The lender will go directly to your account to take out money to pay the loan and it is nearly impossible to cancel or stop the payment. This spells disaster for you if you don't have the money in there. This of course leads to additional bank fees. The key takeaway is that these types of lending tools should be avoided at all costs. Do the smart thing and get your credit repaired with a reputable credit repair service. These are just some of the reasons why you should pursue credit repair in 2019. If you still feel hesitant about committing to the process, you should check out our Credit Repair Guides (https://www.creditmarvel.com/guides/) for more information, which can help increase your confidence and put you on the right path to choosing the best credit repair company for you.